Want to know something a little bit scary? In the US, an average family of 4 wastes about 20 pounds of food a month or about $2300 a year. That's like every family throwing out 80 hamburgers or 2 DOZEN boxes of cereal a month. 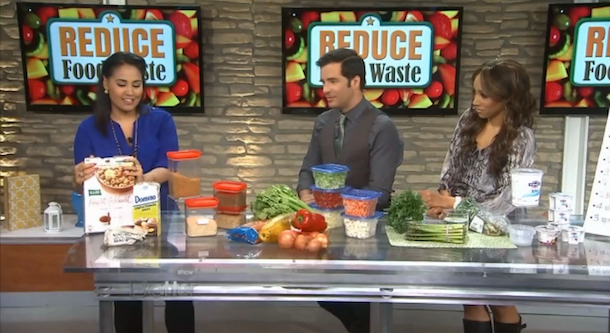 I was on The Better Show this week sharing some of my favorite tips to help reduce food waste AND save a lot of money in the process. Head to the Container Store or Bed Bath & Beyond and get yourself a set of stackable bpa-free plastic containers or glass jars (these are my favorite!). 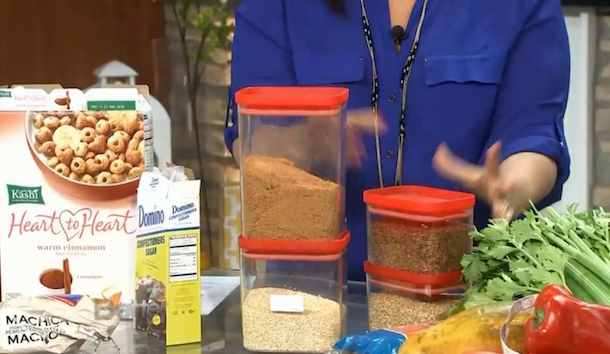 By transferring all your dry goods--cereals, grains, flours, crackers--from flimsy boxes and bags to durable containers, you'll help them last weeks and even months longer! Restaurant chefs all have someone to prep their ingredients so that all they have to do is cook. We may not have that luxury, but it really only takes about 20-30 extra minutes on grocery day to prep ALL your ingredients for the week, making it easier to get dinner on the table and to keep from wasting all those expensive veggies and meats. 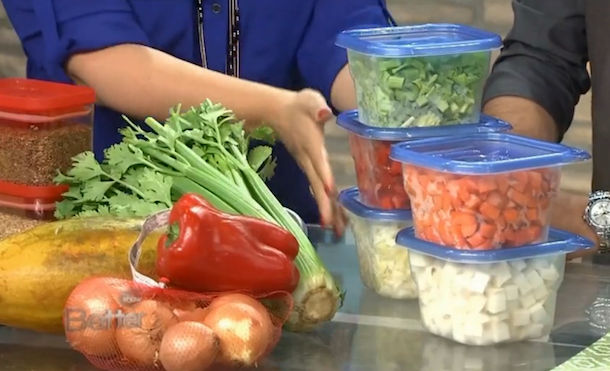 As soon as you get home from the store, take a few minutes to chop up those onions, peppers, and veggies. Wash and dry salad greens. And divide chicken breasts into baggies with marinade. Once the week begins, all you'll have to do is toss a few things in a pan and dinner will be ready in minutes with NO extra mess. Try it just once and I promise you'll be AMAZED by how much easier life gets, and how much healthier you'll be eating. No more wasted food and veggies! This is the tip we didn't get to on the show, but it's one of my favorites! Help keep track of what's in your fridge by posting a list of everything that's inside right on the fridge door. Whenever you use something, cross it off. This way, you'll easily see what you have left and what needs to be used up. No more forgotten packages of chicken breasts lost in the back of the fridge! All those individual plastic yogurt containers and small bags of chips may be convenient, but they create a TON of waste. 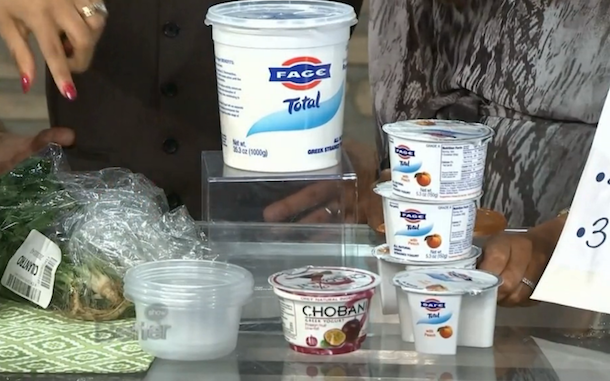 Buy bulk containers of yogurt, apple sauce and other favorite snacks, and portion them into small reusable containers for healthy grab-and-go snacks without the waste. Not only is it better for the environment, you'll also be saving money since bulk is always cheaper! Click here for my favorite DIY yogurt cup recipe. 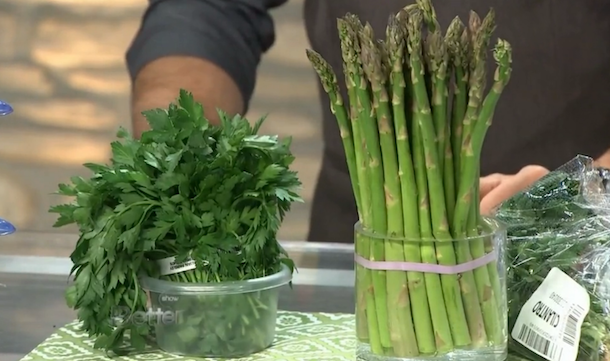 Here's an easy and fun trick to help your herbs and veggies like asparagus last up to 10 DAYS longer. Take them out of the plastic bags and store them upright in small containers filled with water--just like a bouquet of flowers! Keep these in the fridge and take them out to use as you need them. The water keeps the herbs and veggies fresh and bright green. No more gross wilted herbs! Click here for more easy tips to reduce food waste!